Worship Leader Roy Fields has been the lead musician for the Florida Revival in Lakeland, Florida, and has delivered over-abundantly the best worship I have heard. As a musician, Roy Fields is hugely talented. 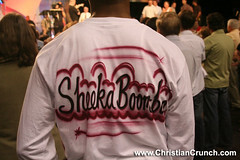 His gift for prophetic worship and the ability to lead the congregation is unmatched. With every service in Lakeland, Florida, whether at Ignited Church, Auburndale Life Church, The Lakeland Center, or Tiger Town stadium, Roy Fields have been able to lead us in. Even tonight, at the Lakeland Center, as I watch on God.tv, Roy Fields is moving under the power of God in a mighty way, bringing a sweet spirit of worship into the arena. 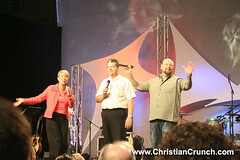 He has served many of the men of God with his worship, such as RT Kendal and Jack Taylor, as well as here with Dr. Rodney Howard-Browne and his wife, Adonica. Roy Fields, Dr. Rodney Howard-Browne and Adonica Browne in Minneapolis, Minnesota. To learn more about Roy Fields, his wife Melanie Fields, his biography as a worship leader, or anything else, check out his ministry site at www.runwithfire.com. 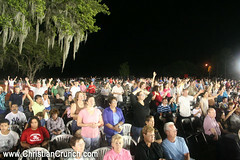 Check out updates from the Florida Revival in Lakeland, Florida where Roy Fields is leading worship.